Nowadays working with a version control application like Git is mandatory for all software developers, even those that work alone in private projects that are not going to be published anywhere. In the first part of this article we covered the basic benefits of working it explaining some of the most commonly used features, some very well known, others not so much. Read this part the article to learn how use Git in projects the involve collaboration between multiple developers, how to take advantage of existing Web platforms that support Git, and how to migrate from older version control applications like SubVersion. Who to Blame for bugs? This part of the article assumes that you are familiar with the concepts of Git introduced in the article first part. This time it is covered the application of those concepts to improve the quality of your software development environment. Previously branches were described as a means to work on new experimental features without interfering with the main code of your project. Lets see how branches and other features of Git can be used in practice to promote better collaboration between developers working on the same project. Git Flow is a model for creating branches with Git, created by Vincent Driessen. It became popular among the community of developers that work with Git because it is very convenient for collaboration within development teams and works well when the teams grow. When a developer starts working on a new feature or bug fix, he creates a new branch. When he is done with the new feature or the fix, he merges the new branch back to the main branch. GitFlow supports feature branches and hot fixes. The feature branch will be merged back to the develop branch (some kind of staging area) ready to be release. The hot fixes are done on tagged release that will only contain emergency fixes, so they are treated in isolation. Git Flow makes parallel development easy by isolating new development from finished work. For developers, changing between the branches they are working on, or starting new feature branches in the middle of something is fast and easy to do with Git. Git keeps track of the modifications without creating a new repository from scratch. It is easy to see and follow what each collaborator is doing, inspecting the commits and jumping on branches. 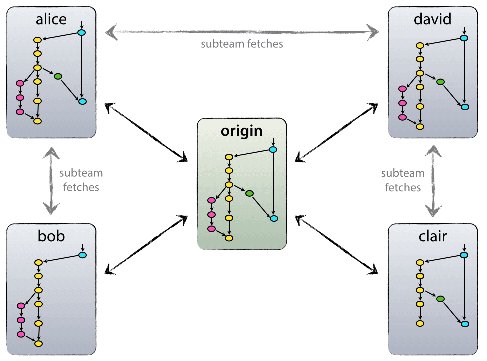 You may learn more about Git Flow on Vincent Driessen blog. He also provides tools to make it easier to implement Git Flows in your projects. If you have found a bug in your code and you want to know when was introduced and why, you can use git blame command. This is a command that shows when each line of a given file was last edited and by whom. Git has been supported by many project hosting sites. Here follow some considerations on the two most popular Web based project hosting service based on Git. Github is the largest project host on the planet with over 25.2 million repositories. Some of the main features are the integrated issue tracking, the collaborative code reviews, and easy team management. Bitbucket is sometimes the company choice because of the strong team management tool it provides. Bitbucket manages the GitFlow in an easy way, and it is totally integrated with Jira, their issue tracking application. If you have been using SubVersion version control application and you would like to switch to Git, migrating from a SubVersion repository to Git is quite easy using several tools that are available on the Web like svn2git and subgit. Some tools provide the possibility to synchronize back to SubVersion after having done modifications to the project using Git. In this part of the article we learned about important practices using Git that make collaboration between multiple developers work better in your project, important features of the two main project Web hosting platforms that support Git, and how to migrate to Git from SubVersion. If you liked this article or have a question, post a comment here.